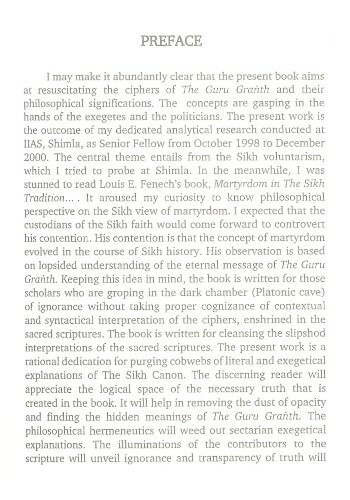 I may make it abundantly clear that the present book aims at resuscitating the ciphers of The Guru Granth and their philosophical significations. The concepts are gasping in the hands of the exegetes and the politicians. The present work is the outcome of my dedicated analytical research conducted at IIAS, Shimla, as Senior Fellow from October 1998 to December 2000. The central theme entails from the Sikh voluntarism, which I tried to probe at Shimla. In the Meanwhile, I was stunned to read Louis E. Fenech's book, Martyrdom in The Sikh Tradition............It aroused my curiosity to know philosophical perspective on the Sikh view of martyrdom. I expected that the custodians of the Sikh faith would come forward to controvert his contention. 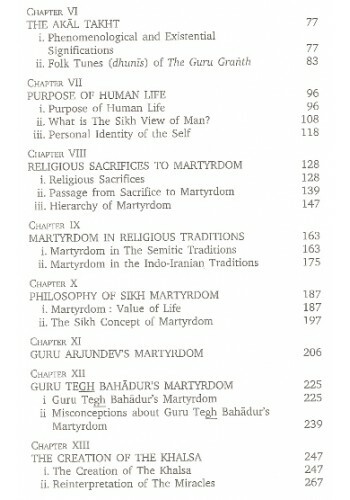 His contention is that the concept of martyrdom evolved in the course of Sikh history. His observation is based on lopsided understanding of the eternal message of The Guru Granth. Keeping this idea in mind, the book is written for those scholars who are groping in the dark chamber (Platonic cave) of ignorance without taking proper cognizance of contextual and syntactical interpretation of the ciphers, enshrined in the sacred scriptures. The book is written for cleansing the slipshod interpretations of the sacred scriptures. 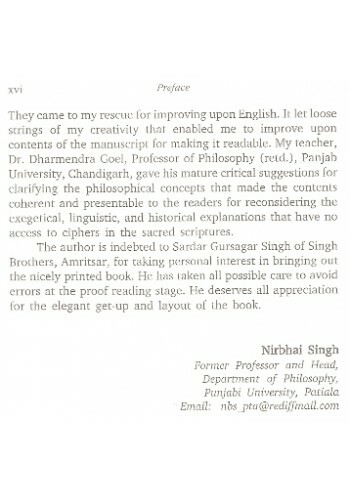 The present work is a rational dedication for purging cobwebs of literal and exegetical explanations of The Sikh Canon. The discerning reader will appreciate the logical space of the necessary truth that is created in the book. It will help in removing the dust of opacity and finding the hidden meanings of The Guru Granth. The philosophical hermeneutics will need out sectarian exegetical explanations. The illuminations of the contributors to the scripture will unveil ignorance and transparency of truth will come up. The interpretations of the sacred scriptures are dressed up in the modern philosophical idiom. It has been endeavoured to harmonize the medieval and the modern contexts. The interpretations of the hymns emanate from the primary sources of the sacred scriptures. 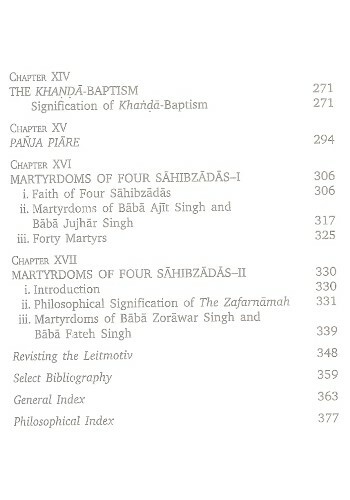 The aim of the book is to project new insights into the concept of the martyrdom.In the Sikh tradition two sacred scriptures, The Guru Granth and The Dasam Granth are revered. The former is a standardized scripture. The Gurus themselves canonized the text. It became perennial fount of the Sikh principles for guiding humanity in the existential societal life. The Sikh moral conduct and values emanate from it. However, spiritual and moral values may be reiterated from the Guru's deeds. There should be optimal reconciliation between the doctrines of The Guru Granth and deeds of the Gurus. The meanings can be safely worked out by sound theoretical ratiocination and putting them to use. The latter is an encyclopaedic anthology of religious literature which sheds light on the current medieval folklore which mirrors the Indic mythical and the Semitic world-views, and cultural milieux. The Dasam Granth is an apocryphal anthology on religious literature and the medieval historical allusions find mention in it. The Sikh scholars debate its authorship. Some of its hymns are recited at the time of the Khanda-baptism. Some Sikh scholars have done researches in the field of manuscripts, relating to The Dasam Granth. Their arguments are mainly based on the variant recensions of the manuscripts. For want of a standardized version, the controversy of authorship remains unresolved. They are not concerned with exploring the hidden meanings in the scripture. It is a fruitless intellectual activity to enter into controversy regarding its authorship. The law of parsimony warrants that the controversy can be resolved only if we take it as an apocryphal religious anthology. Guru Gobind Singh's authorship has been imposed on it for according reverence to it. To be on the safe side, we may say that the character of Guru Gobind Singh is like the one in a creative work. For instance, the character of Socrates in the dialogues of Plato is different from the historical Socrates. Likewise, the characters in the epics of The Ramayana and The Mahabharata are picked up from history, but the creative minds of Valamika and Vedavyasa respectively transformed them within the plot structures of the epics. In the same way, the character of Guru Gobind Singh should not be muddled up with the historical. These are given to communicate some deep mystical meanings. The character of Guru Gobind Singh is not historical, but the mouthpiece of meanings of the Gurbani. 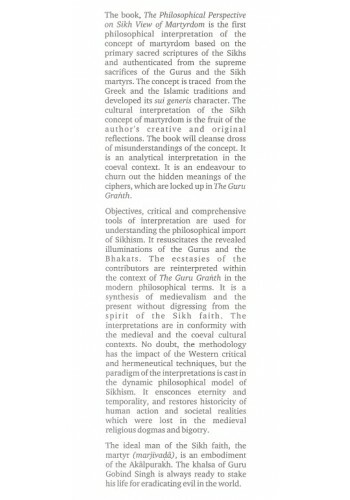 Similarly, Guru Nanak of The Guru Granth is historical and in the Janamsakhi tradition is a created construct. Guru Nanak in scripture is real historical celebrity and in the Janamsakhi tradition is the mouthpiece of his message. The present book is intended for the general reader who is keen to enrich his understanding of the Sikh faith as well as for the specialist scholars. I want to make the readers aware that no translation of the original sacred scripture can bring out the dignity and grace of the original text. Its melodious musical measures and the language of the folks are difficult to recapture in another medium because the cultural milieu changes. It changes meaning in new cultural contexts. I, therefore, have not depended on any translation of The Guru Granth. Original verses in Punjabi are transliterated into Roman script along with diacritics. The sounds of Sandskrit, Arabic, Persian, and Punjabi are based on the standardized recensions of the sacred texts. For the convenience of the readers, I have tried to explain the mystical significations of the verses. I am grateful to my sincere friends who encouraged me to undertake this project for paying debt of gratitude to the spirit of the martyrs who put to stake their lives for their faiths(svadharma). I will be falling in my duty if I do not acknowledge selfless help, rendered by my well wishers who unfurled wings of my imagination. It is an endeavour to revivify the pristine message of the gurbani. They minutely persued the manuscript along with nature critical comments and suggestions. They came to my rescue for improving upon English. It let loose strings of my creativity that enabled me to improve upon contents of the manuscript for making it readable. 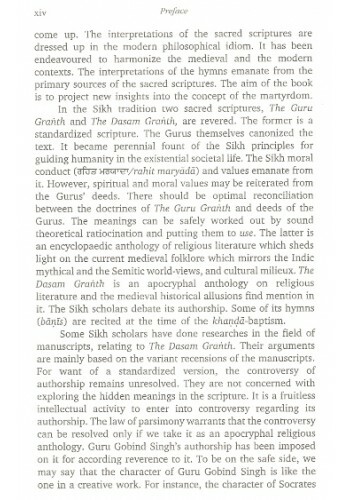 My teacher, Dr. Dharmendra Goel, Professor of Philosophy (retd), Panjab University, Chandigarh, gave his mature critical suggestions for clarifying the philosophical concepts that made the contents coherent and presentable to the readers for reconsidering the exegetical, linguistic, and historical explanations that have no access to ciphers in the sacred scriptures. The author is indebted to Sardar Gursagar Singh of Singh Brothers, Amritsar, for taking personal interest in bringing out the nicely printed book. He has taken all possible care to avoid errors at the proof reading stage. He deserves all appreciation for the elegant get-up and layout of the book. The book, The Philosophical Perspective on Sikh View of Martyrdom is the first philosophical interpretation of the concept of martyrdom based on the primary sacred scriptures of the Sikhs and authenticated from the supreme sacrifices of the Gurus and the Sikh martyrs. The concept is traced from the Greek and the Islamic traditions and developed its sui generis character. 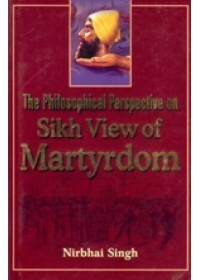 The cultural interpretation of the Sikh concept of martyrdom is the fruit of the author's creative and original reflections. The book will cleanse dross of misunderstandings of the concept. It is an analytical interpretation in the coeval context. It is an endeavour to churn out the hidden meanings of the ciphers, which are locked up in The Guru Granth. Objectives, critical and comprehensive tools of interpretation are used for understanding the philosophical import of Sikhism. It resuscitates the revealed illuminations of the Gurus and the Bhakats. The ecstasies of the contributors are reinterpreted within the context of The Guru Granth in the modern philosophical terms. It is a synthesis of medievalism and the present without digressing from the spirit of the Sikh faith. 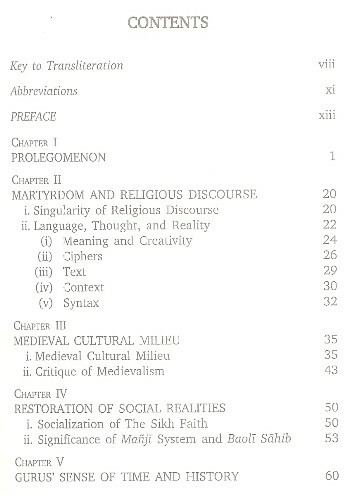 The interpretations are in conformity with the medieval and the coeval cultural contexts. No doubt, the methodology has impact of the Western critical and hermeneutical techniques, but the paradigm of the interpretations in cast in the dynamic philosophical model of Sikhism. It ensconces eternity and temporality, and restores historicity of human action and societal realities which were lost in the medieval religious dogmas and bigotry. The ideal man of the Sikh faith, the martyr, is an embodiment of the Akalpurakh. The Khalsa of Guru Gobind Singh is always ready to stake his life for eradicating evil in the world. Professor Nirbhai Singh (b. 1935) specialized in Philosophy of Sikhism and comparative scriptural philosophies and religious traditions. He retired as Professor and Head, Department of Philosophy, Punjabi University, Patiala. He enjoys reputation as an original radical thinker of Sikhism and has sound understanding of the Western philosophies. His works are radical departures from the existing exegetical explanations of The Guru Granth. He has to his credit more than half a dozen original research works of high erudition. His innovative books are Bhagat Namadev in the Guru Granth, Philosophy of Sikhism, Sikh Dynamic Vision, The Sikh Vision of Heroic Life and Death, etal. For the second time, the HRD Ministery, New Delhi has nominated him as member of the apex Indian Council of Philosophical Research (ICPR) of India. He had been a Senior Fellow at the Indian Institute of Advanced Study (IIAS), Shimla and Senior Fellow of the Indian Council of Social Science Research (ICSSR), New Delhi. Besides, he has contributed more than fifty research papers to the leading research journals and periodicals. He was editor of the prestigious journals: The Journal of Religious Studies, Punjabi University, Patiala, and The Humanities and Sciences, Shimla. He also presented research papers in the National and International Seminars/Conferences in different universities of India. Introduction To 'Martyrdom In The Sikh Tradition, Playing The Game Of Love' By Louis E. Fenech Th..
From The Frontcover Of 'Outlines Of Sikh Philosophy' By Jodh Singh Most of the scholars on Si..